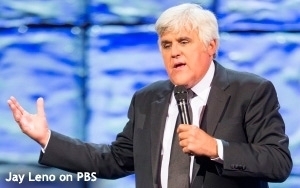 While watching a preview DVD of this Sunday’s tribute to Jay Leno on PBS, I wondered: Why isn’t this show on NBC? On the show -- “The Kennedy Center Mark Twain Prize” (airing Sunday, Nov. 23, at 8 Eastern/7 Central on PBS) -- Jimmy Fallon makes a joke about that very same subject. Noting how Leno maintained the No. 1 ranking for "The Tonight Show" in late-night ratings for the better part of 20 years, Fallon describes Leno as “a man who has done so much for NBC that we had to celebrate his career on PBS." He makes a valid point: In the weeks leading up to Leno’s departure from “The Tonight Show” last February, NBC did almost nothing to give him a sendoff or promote his final shows -- as if the network couldn’t wait to get rid of him. You might recall that while NBC was busy ignoring him back then, CNN produced and aired an hour-long documentary about Leno’s life and career. Around the same time, Leno was interviewed on CBS -- on “60 Minutes,” no less. This Sunday’s special on PBS plays like a show that any broadcast network should have been eager to air. I realize PBS apparently has the rights to his annual Mark Twain Prize show. And it takes nothing away from PBS to make the comment that it seems ironic that one of the biggest stars of the last two decades on network TV would be saluted on public television. Oh, well -- the networks’ loss is PBS’ gain. The show is elegant and funny. And it’s not disrupted by commercials, which is always a plus when watching PBS (except during pledge months). Fallon is one of many guests who came out on stage at the Kennedy Center in Washington a few weeks ago for this tribute in which Leno, 64, was this year’s recipient of the Twain Prize -- an annual honor that has been around since 1998. Other guest-performers include Jerry Seinfeld, Wanda Sykes, Chelsea Handler, Seth Meyers, Robert Klein and Kevin Eubanks, Leno’s former bandleader. Jamie Foxx and Betty White deliver tributes via videotape. Leno spends most of the special seated in a special balcony box at the Kennedy Center, flanked by his wife, Mavis, on one side, and on the other side, his long-time executive producer at “The Tonight Show,” Debbie Vickers. The guests tell a few jokes, reveal why they love Jay and then introduce clips -- most of which are from “The Tonight Show,” everything from the Dancing Itos to Leno’s weekly “Headlines” feature. And again, one is struck when watching these clips by the sheer quantity of Leno’s output on NBC over the years. And again, you wonder: What was NBC’s problem with him? This question occurred to me again and again over the years, going as far back as September 2004, when NBC made that ill-considered announcement that Conan O’Brien would take over from Leno five years hence -- in 2009. At the time, NBC said it was announcing the transition five years in advance in order to set up a smooth, painless transition that would stand in stark contrast to the way the show was passed from Johnny Carson to Leno in 1992. Well, we all know how that “smooth” transition turned out. Of course, last winter’s handoff of the show from Leno to Fallon turned out to be the smooth transition of NBC’s dreams, possibly because Leno carefully maintained a very gentlemanly public image concerning his exit. Sure, he told many monologue jokes that seemed to hammer NBC in the weeks and months before he left, but he probably delivered them less because he was angry at NBC and more because for him a good joke is a good joke, no matter who (or what) the target might be. As this “Mark Twain Prize” special demonstrates, the Leno era of late-night TV was something worth celebrating. But those of us who watched him every night for most of those years already knew that. 1 comment about "PBS Salutes Leno In Tribute That Should Have Aired On NBC". Nicholas Schiavone from Nicholas P. Schiavone, LLC, November 20, 2014 at 3:15 p.m.
NBC lost its compass in 1999. RIP NBC. Adam Buchman is on point again. Nothing like a clear vision in hazy times.